In a first-of-its kind study of comparing the microbiology of Devils Hole with that of a constructed scale replica at the Ash Meadows Fish Conservation Facility (AMFCF), a team of scientists from the Desert Research Institute (DRI) in Las Vegas discovered key differences in nutrient levels and species composition that may be impacting the ability of the highly endangered Devils Hole Pupfish (Cyprinodon diabolis) to survive in captivity. "We were interested in taking a closer look at the chemical and biological factors that control productivity at both sites," said Duane Moser, Ph.D., an associate research professor of microbiology at DRI who has been involved with research at Devils Hole since 2008. 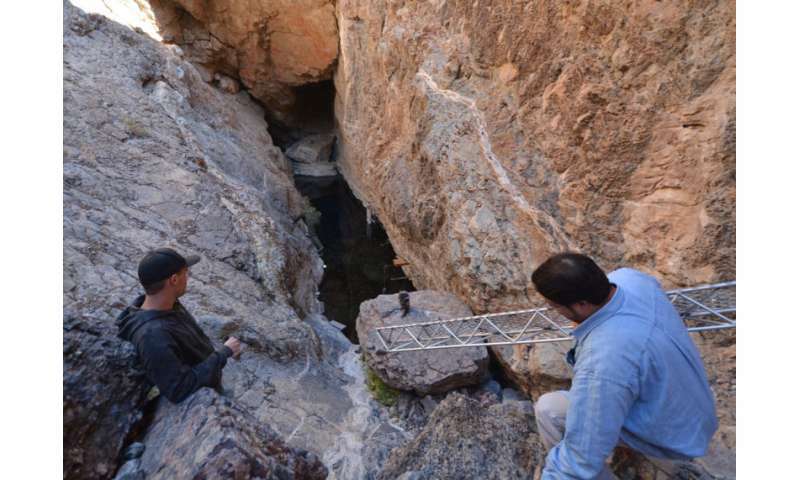 "In studying both, we could gain some insights into how well the artificial refuge actually replicates Devils Hole, and in turn, offer recommendations for ways to make the refuge a better habitat for the pupfish." Devils Hole Pupfish (population 115 in autumn 2017) are an iridescent blue, one-inch-long pupfish. They are native only to Devils Hole, an isolated water-filled cavern of unknown depth located in a detached unit of Death Valley National Park within the Ash Meadows National Wildlife Refuge in Amargosa Valley, Nevada. Devils Hole is an extreme environment, with water temperatures and dissolved oxygen concentrations near their lethal limits for most fishes. Since 2013, scientists have been trying to establish a backup population of these endangered fish in a constructed tank at the AMFCF, which is located a short distance west of Devils Hole. Although the facility was designed to match the climate, water chemistry and physical dimensions of an area of shallow shelf habitat in Devils Hole, the pupfish have had only limited success reproducing and surviving in this artificial environment. In 2015, Moser and a team of researchers from DRI set out to learn if there were other factors that might be impacting the success of these fish. Their new study, published in the March edition of PLOS One, characterizes and compares water chemistry and microbial communities between Devils Hole and the AMFCF. Although water temperature and dissolved oxygen at the AMFCF are intentionally maintained at values that are slightly lower and higher, respectively, from those of Devils Hole, this work shows that the nutrient balance between the two sites is also very different, with AMFCF being strongly nitrogen limited - about five times lower than that of Devils Hole. In the microbial communities, which contribute to the distribution and availability of dissolved nutrients in the water and are also a food source for the pupfish, the research team discovered more than 2,000 microbial species from 44 distinct phyla present in the water at Devils Hole. They detected similar levels of species diversity at AMFCF, but found that different bacterial phyla were dominant at each site. These differences may relate to the observed differences in nitrogen concentrations. "Nitrogen levels have an effect on the types of organisms that you'll find, and the types of metabolisms that they have," said Joshua Sackett, a graduate research assistant with the Desert Research Institute and doctoral student in the School of Life Sciences at the University of Nevada, Las Vegas. "We found a lot fewer of at least one major category of primary producers - the cyanobacteria - in the AMFCF compared to Devils Hole, and we think that's due to differences in nutrient concentration." One of the strengths of the comparative power of this study is that the data from each site were gathered on the same day. 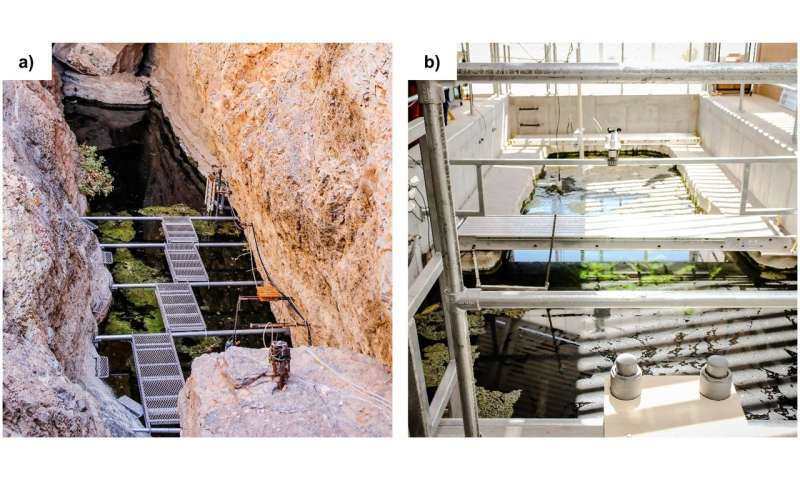 This study highlights the potential importance of considering water chemistry and microbiology when constructing artificial fish habitats - and the team hopes that the information will provide a valuable contribution to the continued survival of the Devils Hole Pupfish in captivity. "This work revealed very different microbial populations, which we infer might correspond to large differences in nutrient dynamics between the sites - especially in terms of nitrogen," Moser said. "Consequently, some relatively modest tweaks in how the refuge is operated could potentially improve the prospects for continued survival of one of Earth's most imperiled fishes." Since it's not mentioned, I wonder if any research has been done to determine the N levels of desert soil surrounding Devil's Hole. Sure microbes are big factors, but what they need to grow and reproduce in such a restricted environment has to be delivered from the outside most often by wind and rarely by rain. The Amazon rainforest depends on regular dust storms in the Sahara in Africa lofting nutrient-rich dust high into the atmosphere enabling it to cross the Atlantic before settling over the Amazon and fertilizing it.